Just got my build date, second week in Oct. Delivery projected end of Nov, first of Dec.
Indium on Chestnut Brown, definitely one of a kind! Post up pictures when it arrives. I think it's going to be a great color combo and yes, one of a kind. Will for sure post pics when it comes in. I have seen one or two Indium Grey w211 sedans on the road, and its pretty rare color choice indeed! 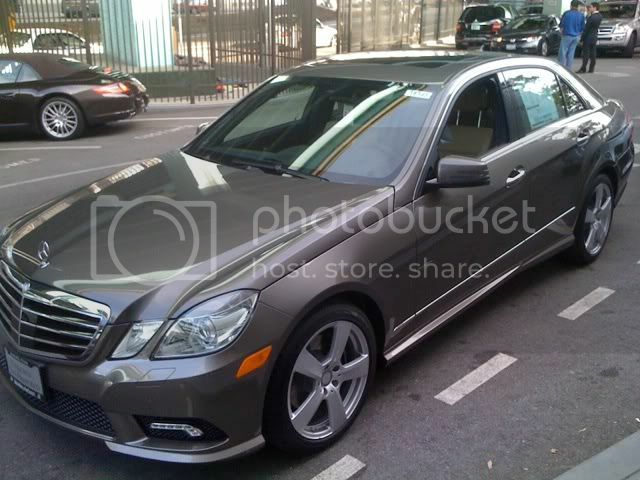 And I havent seen this color on the w212 yet, have you? I like the idea that you can order the sport package for the diesel now. I wish they made that car with 4Matic. It would be my first choice. My dealer tells me Canada may be getting the S class Bluetec 4Matic late in the Fall. That may be my fallback choice in the future. Interesting, as it seems that you can only order the 2011's with the double spoke wheels and 3-spoke steering wheel if you want AMG/Sport Package. Maybe it's different for the Bluetec? Very nice looking combo. But in your original post, you stated you had ordered Indium with Chestnut. These photos show Indium with Natural Beige. Did you change you mind on the interior color ? What happened to the Bluetec labels on the trunk and front fenders ? IMO, 4Matic has been oversold. A RWD E Class with dedicated snow tires will outhandle a 4Matic with all seasons. I had no problem driving on mountain highways in winter conditions in my previous E320 Bluetec equipped with Michelin snows; the car handled very well. 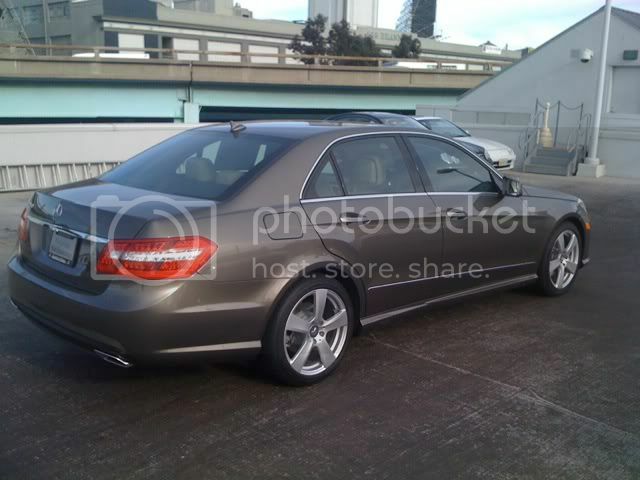 It is a 2011... yes and it is coming with the double spoked AMG wheels and the 3 spoke steering wheel... I am going to switch the steering wheel for the wood leather though when it comes in. The non 4matic option does not bother me.. I have a ML for that. This is not my car... I am just showing what Indium looks like... I am still ordering chestnut. Good ! Your car will look even better with Chestnut. Please post some photos after you take delivery and share with us your driving impressions. Last edited by DerekACS; 09-03-2010 at 11:42 AM. Been there,done that. There is simply no comparison with 4Matic. Driving on snow covered highways is one thing, driving on unplowed streets with hills is another. Eastern Ontario has an average snow fall of 9' per Winter. No question that you live in a snow belt compared to western BC.